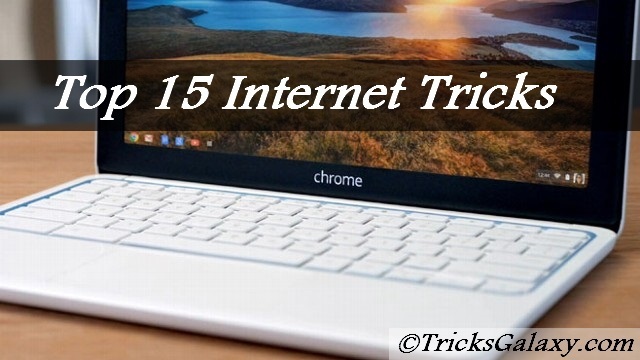 Top 15 Cool Internet Tricks: Now-a-days every internet user are enjoying Internet with their own style. Do you know any Internet tips? Well, Today here at Tricks Galaxy, I have shared Some Cool Interesting Internet Tricks that i have Collected. I have personally tested all these Internet Tricks and then shared here. Hope you like it. Enjoy! 1.13 #13 Download Facebook Videos without Any Software. To open last closed tab in PC/Laptop you need to press Ctrl + Shift + T. Working in Google Chrome and Firefox. If you want to add .COM to any word you type in the browser’s address bar. Then just press Ctrl + Enter instead of manually typing .COM from your keyboard. Working in Chrome/Firefox/Opera. Hold down “Ctrl” key while clicking on the link to open that link in new tab. Mac users can hold down “Apple Key/Command”. Wanna turn your Browser into Notepad? Just copy below code and paste into the URL bar in your browser and hit Enter. You’r done. Working in all browsers. It is the same thing but in Night-mode. To use browser as a notepad in night mode, use below code. Incognito Mode: It is temporary browsing modes. You don’t leave browsing history and cookies on your PC/Laptop, but you can still see your existing history, bookmarks, passwords, Autofill data, and other Chrome settings. Keyboard Shortcut: To open Browser Window, press Ctrl + Shift + N. Working in Windows, Linux, and Chrome OS. If you’r filling out an online form, e-mail, or other text field, you can move between each of the field very quickly. To move in the next field press Tab key or press Shift + Tab to move back to just previous field. Open Google and search for “google in 1998” to see the original homepage. Type “do a barrel roll” in Google search and hit Enter. Go to images.google.com and search for “Atari Breakout” in Google Images Search. Enjoy! Working in All browsers. Open Google and do search for “zerg rush”, and try to stop “o” invasion. Working in Chrome, Firefox, Safari. Is your video starts playing automatically every time and want to Turn it OFF, then go to facebook.com/settings, click “video” on the left tool bar, then select “Off”. Auto-play video be gone! Enjoy. #13 Download Facebook Videos without Any Software. Which method you’r currently using for downloading videos from Facebook? Do you know your can download any Facebook Video directly to your Desktop without any Facebook video downloader or any other third party software. Here is How to Download Facebook Videos without Any Third-Party Software. Trick 1: Open any image in Google Image search and then press S + Right Click on the image to do reverse image search. Trick 2: Just drag an image to the search bar. Reverse image search made simple and tested & working in Chrome and Firefox. Try yourself. If your don’t know (or forgot) the current password but still logged in to your Facebook account in any browser then it is very helpful for you. Open Facebook.com/hacked and enter you new password. Enjoy! you’r done. So, These Were All Internet Tips & Tricks, Did You Know All These Tricks? Please Share Your Views In Comments. Thanks For Reading.